This patient had a bunion that is corrected. Also, the second toe overlapped the big toe. We have released the medial side to stop the pull towards the big toe. Below, we are putting in sutures on the lateral side to aid correction and maintenance of the reduction of the second toe joint. After the repair of the 2nd MPJ, we perform a PIPJ Fusion and temporarily pin the second toe across the MPJ to allow healing of all bone and soft tissue. This pin is taken out in the office at approximately 6 wks. The following is depicting a bunion deformity of the great toe that has worsened a hammertoe contraction of the second toe. The outside deviation of the great toe caused underriding of the second toe, which leads to increased dorsal (upward) dislocation of the toe. Post-operative repair of the bunion and hammertoe deformities which straightens the great toe utilizing a combination of bone cuts and soft tissue releases of the great toe and second toe to correct abnormal position of the toes and significantly improve pain with activities and use of shoes. Below is a photograph of a severe overlapping bunion and hammertoe deformity. At this point in the mechanical process the digits, especially the second digit, is dislocated from its articulation with the longer bone in the foot called the metatarsal. Severity of these deformities is multi-factorial involving genetics, altered mechanics with soft tissue contractures, and bad shoegear. Below is a photograph of the front view of the same deformities that are pictured above. 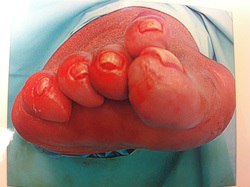 Pictured below is the same foot after surgical correction of the bunion deformity of the great toe and hammertoe correction of the second, third and fifth toes. The plastic balls at the top of the second and third toe are covering wires that hold the position of the second and third toes into the longer bones (metatarsals) of the foot so that the soft tissue contractures heal in the correct place. Depending on the deformity, the wires will stay in place for a period of 4-6 weeks and then are removed. Term describes abnormal flexion posture of PIP joint of one of lesser four toes. The hammertoe deformity is similar to the curly toe deformity but is not malrotated. Flexion deformity of PIP may be fixed or supple. With severe hammertoe deformity, MP joint may go into hyperextension (distal joint usually stays supple). May involve contracture of FDL tendon. When this is the case look for a dynamic deformity, ie. the hammertoe is worse when the patient stands or walks. Long second metatarsal may be a predisposing factor. High heels and crowded shoe wear are also common causes. Less common causes are RA, crossover deformity, diabetes. In rare cases hammertoe deformity may be due to plantar fascia release. With MP joint contracture, contracture of EDL may prevent the MP joint from obtaining a neutral position. Main action of the EDL is to dorsiflex the phalanx, but can only do so when the phalanx is in a neutral or flexed position. Tends to involve second metatarsophalangeal joint. Occurs spontaneously in women and results in pain and disability. If long metatarsal is a strong risk factor, and the EHL/EDL is the most important dynamic deforming force. It usually subsides after 3 to 6 months, but may go on to frank dorsal subluxation. With dorsal dislocation, there will usually be attenuation of the volar plate. After it has subsided patient may be left with subluxated MTP joint and fixed hammertoes deformity. With crossover toe deformity look for tight medial collateral ligament and plantar skin changes. Taping of toes may prevent further deformity but will not reverse deformity. If deformity is of recent onset, one can use pads over corns & have patient perform daily stretching of the PIP joint. Hammertoe straightening orthotics are also available. Bunion must be corrected prior to correction of hammertoes (pressure from the big toe is deforming force for hammertoes). Hammertoe can be corrected by transfer of FDL or EDL tendon over mid-portion of proximal phalanx, which serves to augment intrinsic function (MTP flexion and IP extension). Implies no fixed contracture at MP or PIP joint, but deformity increases on wt bearing. Consider isolated tenotomy of the FDL tendon. Flexor tendon transfer: may or may not be appropriate indicated for a young adult with a mild deformity. 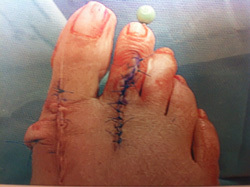 This procedure may cause the base of the toe to remain swollen (or fat) giving a poor cosmetic appearance. This procedure may cause the toe to remain too straight, again causing a poor cosmetic appearance. There is fixed or partially fixed contracture at PIP joint and mild extension contracture at MP joint. Flexor tendon transfer may be more appropriate for moderate hammertoe deformity. Involves fixed flexion contracture at PIP joint with fixed extension contracture of MP joint (or subluxation/dislocation) of base of proximal phalanx on MT head. Release of dorsal MTP capsule. Collateral ligament release if needed for MTP joint reduction (down to volar plate). For dislocations of the MTP joint, an MTP resection arthroplasty is performed. With fixed PIP and MTP deformities, K-wire stabilization is required for 6-8 weeks.